How do we start our own project? 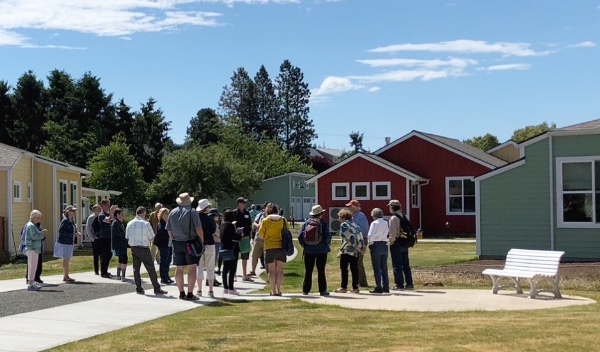 On Saturday, June 16, we showed off our village to 20 visitors who were attending Chuck Durrett’s weekend intensive on the topic of cohousing. 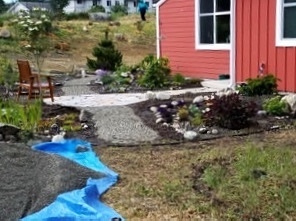 The workshop was held on Bainbridge Island and the participants were bussed here to Port Townsend for a day. 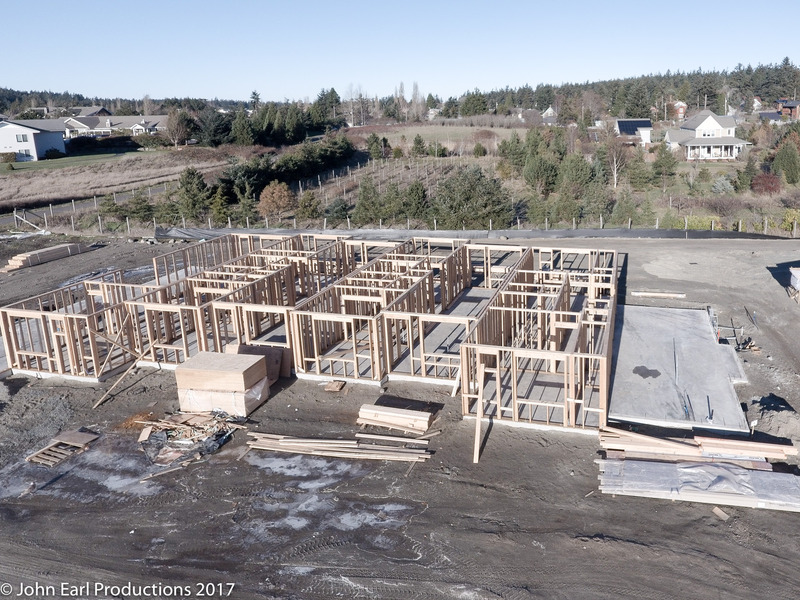 They were given the opportunity to see how all our hard work paid off and learn how they could move forward with their own project - everything from how to find members, how to buy land, how to get financing and, most importantly, WHY cohousing works. We had an opportunity to share our accomplishments and brag a little about how much we love living here. Chuck’s passion about the topic was on display as he led participants through the day. Our own founding members, Pat, David, Mack and Carolyn, presented most of the specific information about Quimper Village. How do we join an existing cohousing group? 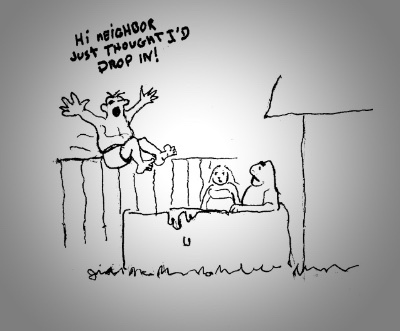 Every community is different in the way it advertises and sells an existing home. At Quimper Village we have chosen to use our newsletter and webpage (soon to be updated) as our primary ways to keep folks who are interested in joining us informed about available homes. We used to maintain an 'interest list' but it became too unwieldy to maintain. 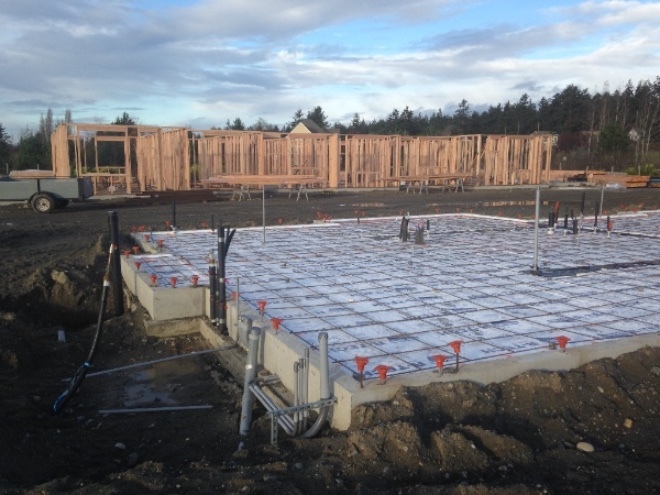 Quimper Village anticipates having a two bedroom/one bathroom home (910 sq ft) available later in the summer. 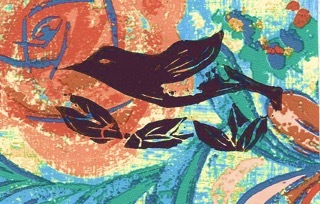 When further details are known, we will publish them in our monthly newsletter, perhaps even in a special edition. Keep watching this space! We encourage prospective buyers to investigate what it means to live in a cohousing community; how living in community can enrich lives and the expectation for active participation in community life. When more details become available, consider coming for a tour and even joining us for a meal or a meeting. 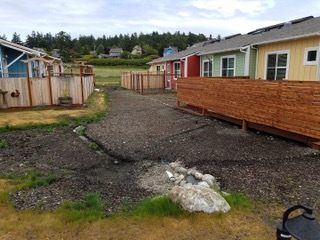 Skagit CoHousing: We Have Land!!! We are very excited to have a gorgeous 4 plus acre parcel of land under contract in beautiful Anacortes, WA. 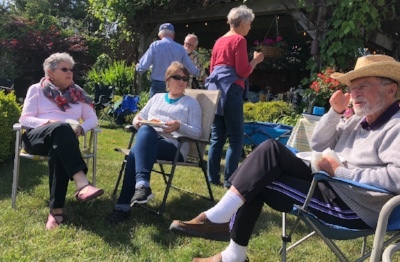 It is a big step in realizing the dream of living in a cohousing community in the Skagit Valley shared in the beginning by a small group of friends in Mount Vernon. As we move forward, we continue to seek families interested in living in an intergenerational cohousing community. While we are still several years from move in, we know that living in community begins now. I opened the curtains this morning to see what the day might bring in terms of weather and there right in front of me was my first sighting of a hummer checking out the penstemon flowers that have just opened in my yard. Beating its wings furiously with almost no apparent effort at all (I’ve read that those small wings move 70-80 times a second). I called John to the window to see it for himself. And sure enough, we danced with joy. We’ve been trying to attract the critters to the back yard with no luck. Cheron and Mena have the hummers flocking (well at least one at a time, but often) to their three porch feeders. Irene and others have seen sightings along other pods, but not for us before Solstice. David H had a hummer land right next to him while he was just sitting on his new back deck. It’s always a treat to see them sit still for a quick rest. I think David might have sung to it as well. We had a resident Anna’s hummingbird live in our backyard at our old Jefferson Street house and loved seeing them in all kinds of weather. We especially enjoyed how, in the winter freezes, one would come up and almost knock on our kitchen window while looking in and buzzing back and forth to remind us to bring the feeder in to thaw it out. Anna’s are often found in our area year around. There are a couple of other hummers, the rufous, black chinned and calliope, that sometimes pass-through Port Townsend during the summer months. We can keep an eye out for them as well. The solution should not contain dyes, just sugar and water with 1 part sugar to 4 parts water. Boil the water, stir in the sugar and let it cool. If you think you will provide a healthier diet by using honey instead of sugar, don’t do it. Honey apparently promotes fungus growth in the feeders and will cause disease in the birds…and we know that we don’t want that. Change your feeders at least every four to five days (can be more in the hottest times) to keep them fresh. Be sure to clean the feeder out after every change of sugar water. 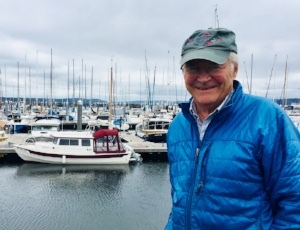 Port Townsend, located on the tip of the Quimper peninsula, an appendage of the Olympic peninsula, surrounded by water – what a perfect place for boating! Port Townsend originated as a seaport in the latter part of the nineteenth century, mainly because of its fine harbor. It is home to 2 marinas that attract a wide variety of boats from all over for both mooring and repair. Several opportunities to learn wooden boat building skills also attract people to the area. Some of our Quimper Villagers indulge their lifelong interest in boating. Janet grew up in Southern California, never far from the water. First as a camper and then on the waterfront staff, she spent her summers at a camp on Catalina Island, where she learned canoeing, sailing and other water sports. Her family had a 16’ motorboat; she now has a 14’ motorboat, mainly for crabbing and fishing. After moving to Port Townsend in 2005, Janet saw an ad for rowing at the Rat Island Rowing and Sculling Club. She started sculling then, became hooked on the sport, and has been sculling/rowing ever since. During the spring, summer and fall, if you’re up early enough, you’ll find Janet on the water about 5 days a week in one of the club's 4- or 8-person boats. She loves the social, recreational and fitness aspects of rowing. “Being in tune with your crew requires precise movements and rapt attention.” Janet also finds time to solo in her own single scull and kayak which she finds to be quite a different experience, being quiet and meditative, while reveling in the beautiful scenery. You may also find Janet lifeguarding at the community pool about 15 hours a week. Jack, on the other hand, grew up in Kansas and didn’t start sailing until he was 34. He began his sailing career inauspiciously in Texas with a plastic boat that fit on top of his car. It survived moving to its new home on a Virginia mountain lake near Virginia Tech. Soon he bought a Jolly, a racing boat, technically quite challenging and rewarding – literally, as he and his daughter Kerry began acquiring trophies. They graduated to a 16’ double trapeze Hobie Cat in 1977, which could sail right on and off the beach. They continued to amass trophies amidst fleets of over 100 other racers. In 1978 they moved to Pensacola Florida, and Kerry went off to college. Then it was son Cameron’s turn to be crew for his dad. Jack says a crew is as essential as a captain, cooperation being the key to their success. The racing circuit along the Gulf Coast from Florida to Texas had races most weekends. They continued to pick up more trophies, and qualified for the US Nationals – the top 80 Hobies in the U.S. Jack was commodore for all Hobie fleets in four states. Carolyn, a confessed landlubber and not wanting to be left out, served on race committees, managing races. After Cameron went off to college, Jack quit racing. Carolyn and Jack moved to Cape George in Port Townsend where Jack shares a 22’ Nonsuch sailboat, competing in just one race a year. 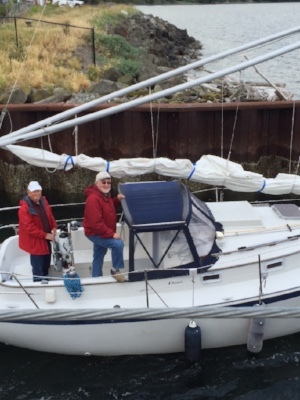 He continues to love sailing the waters of the Salish Sea, enjoying the quiet, and the challenge of sailing. GARDENS! ROCKS! YARDS! HARDSCAPE! WEEDS! LANDSCAPE! Some solid as King Arthur’s castle and others as delicate as Charlotte’s Web. Some complete, others half done, and still others, not-yet begun. Some practical and little more, others aesthetic from top to floor. 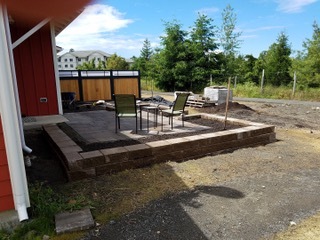 Wooden decks, paver patios, cedar and Hogwire fences, and stone-block flower beds, not to mention the trees, shrubs, flowers and hot tubs. So far, I’ve counted 4 hot tubs in the village. Mike, Aaron. Lawrence and other craftsmen build the fences, patios and decks. 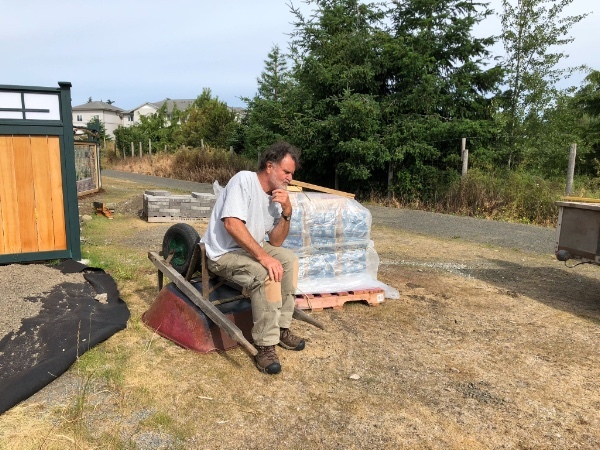 The designing and planting are, for the most part, the work of the unit owners, but some members have enlisted Jean Marie, Zoe, Mikel, and Karen for the job. 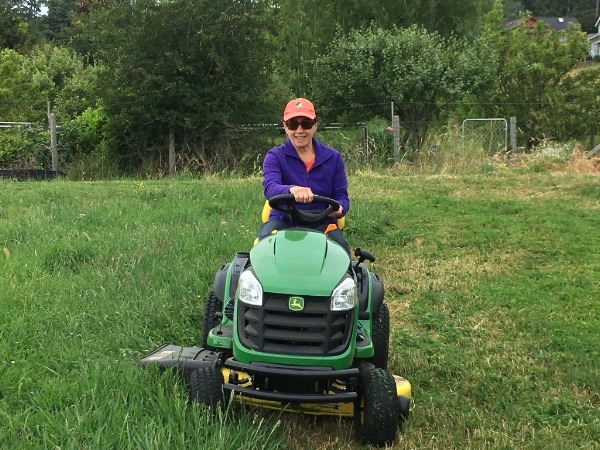 Multi-talented Araya helps control some grasses. The dog run is nearby. Lawrence considers his next move. He is one of the hard workers who has been helping us create our yards. --- Quimper Village: a little history, without worrying too much about dates, and with just a little imagination here or there because it makes a better story. In other words, history the way it should be, as described, mulled over, sometimes invented just a little, by Jack Salmon. This article was written sometime in 2016. I’m not building a custom house. I’m building a custom community. 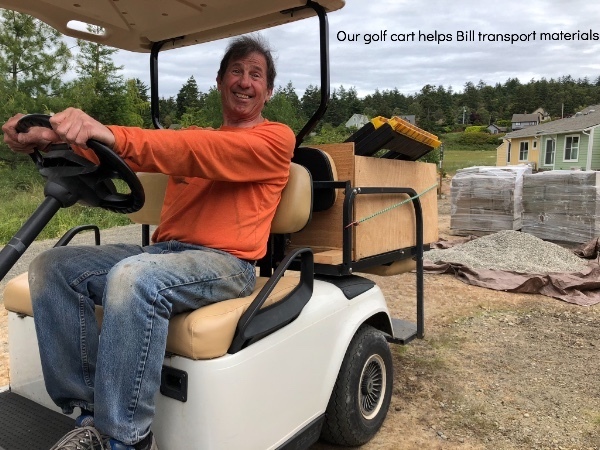 So you want to build cohousing for 28 singles/couples, plus a community center, garages, garden shed, shop, paths and a yellow brick road — everything needed to go happy ever-aftering in our Emerald Camelot with a song in their hearts. But right now you’re standing in the middle of six acres of tall meadow grass and blackberries and you notice a serious shortage of yellow brick road pavers. Carolyn and I used to dream about the house we would build. We were allowed to use sharp pencils then, so we drew lines to design The Perfect House. Then we talked to a builder, who revealed a Great Truth: house walls are thicker than pencil lines. Who knew? Further revelations came forth: doors won’t swing through walls or stairways. Staircases take lots of space on TWO floors. Try listing or creating a model of everything needed to build a house. 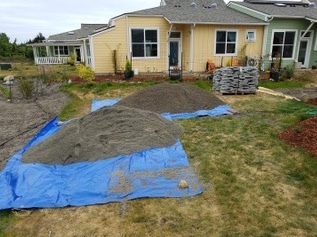 Then scale up to 28 of them, plus a common house, garages, shop... Did you remember to grade and level the site; find out where the sewer connection has to be; pick roofing materials? What kind of bathroom sink? What lega l structure must the group have in this state? Should closet doors fold, or slide, or swing? The smartest thing you can do is hire people who know things you don’t -- architects, engineers, lawyers -- early in the game, and listen to them. But you have to tell these consultants what you want, and it’s difficult to get 28 households to agree on anything, let alone what color to paint the place? You need help. We hired Chuck and Katie. 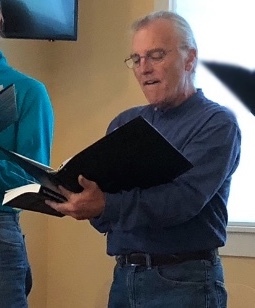 Anyone who has done six Workshops with Chuck Durrett will remember The Master’s Hand at work. Chuck helped us understand we can’t have precisely what every person wants, but that we can get good outcomes, workable and good for the group. He has a remarkable ability to help people decide that they ALL want, say, stainless sinks, and garages, not carports. Good enough to use, safe enough to try. Bravissimo, maestro! One thing he tells us, again and again, is that his job includes helping us ALL afford these houses: nice houses, built on budget. Remember that critical shortage of yellow brick road pavers? Yellow = GOLD! To build 28 houses plus a common house and a bocce court and pay all those smart engineers and folks you need lots of gold. And another important thing: permission. If you want to pile concrete and lumber all over a few acres, dig holes and shove dirt around, some people are likely to object to the mess you’re making in their nice orderly city. Now is a good time to panic and run around in circles. Great exercise! But we’re older folks. Running isn’t our thing. Our QV financial people called Katie McCamant, the half of McCamant and Durrett who knows about gold and how to talk banks into renting us some of it, and what permits are needed and how to get them. Should our Common House have a bar, a fireplace, a patio, room to dance..? Do our houses need “gourmet” kitchens? Through it all Chuck told us again and again to keep gold consumption down, using well-designed and built “production housing”: a few basic floor plans, high quality materials, as much uniformity as possible while still providing variety, and very importantly NO CHANGES ONCE DECIDED! Changes generate “churn”: they require some degree of redesign, an amazing amount of management cost (different material ordered, inventoried, billed, paid, and carefully tracked to be sure George’s special sink doesn’t go in Pete’s house). For churn you pay extra. Choices of design and materials were made, the site was designed (28 houses, Common House, streets, fire lanes, garages, parking, garden shed, storm water controls...). We did “value engineering” to decide if this or that was more important, or what we could do without. Then Katie, Chuck, and our project manager, the ineffable Fred Kimball, applied years of hard-won experience and estimated how much gold we’d need. A few people decided that it was too much; they couldn’t afford it. Others said “if it doesn’t go up, or at least not very much, I can squeak in - and I really want in.” We wanted them in too. We all agreed: these people are our friends, this much gold per square foot is our limit. Go! While a few labor mightily, the rest of us quietly contemplate our navels and electrical wiring diagrams and have happy dreams. Sure we do! As it starts to seem real, it gets scary: worries, doubts, second thoughts. Look hard at anything and you’ll find some nits, and nits are for picking, and picking can make them bigger. Community muscles can weaken, individual perspectives magnify. We set our budget ceiling and determined to keep it so we could all have enough gold, all be Quimper Limpers together. We sang the Quimper Musketeer song: “one for all and all for one and we all benefit and I’ll take one for the team and it’s not about the buildings it’s about the people.” But now the harmony sounds a bit off. Oh well — had to happen sooner or later. 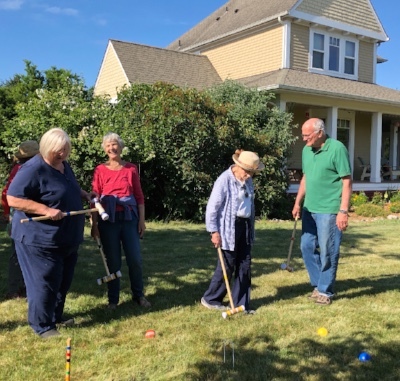 Our generous neighbors to the north, Jeannie and Brian Glaspell, invited us over for a lawn party and croquet. While skill was questionable, enthusiasm and laughter were evident. 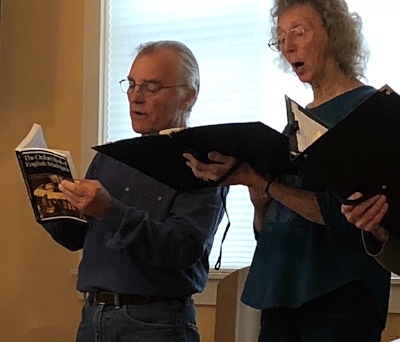 After dinner one evening, we were treated to the music of The Magnificent Madrigal Singers: Doug Rodgers, Richard McGuffin, Mike, Phyllis, Pat Rodgers. Music of Palestrina, William Byrd, Thomas Morley and others kept us enthralled. Thank you! 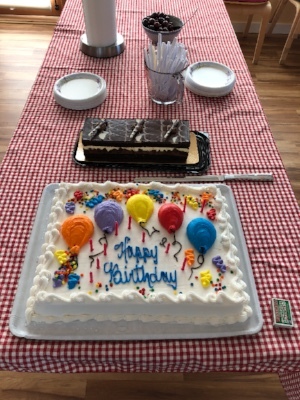 We might be a senior community, but we LOVE to celebrate birthdays. 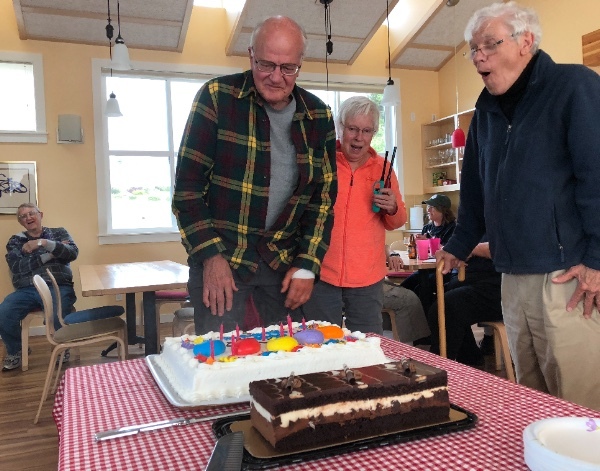 While Mack is getting ready to blow out some candles, Howard, Inge-Lise and DavidH are standing by. We encourage dinner guests to join us. All they have to do is let us know a few days in advance, so the cooks can buy and prepare enough food. 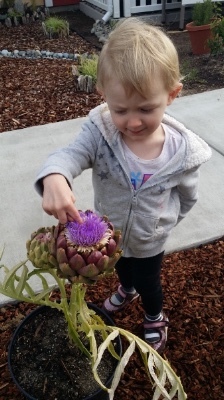 At left, Ari investigates an artichoke flower. 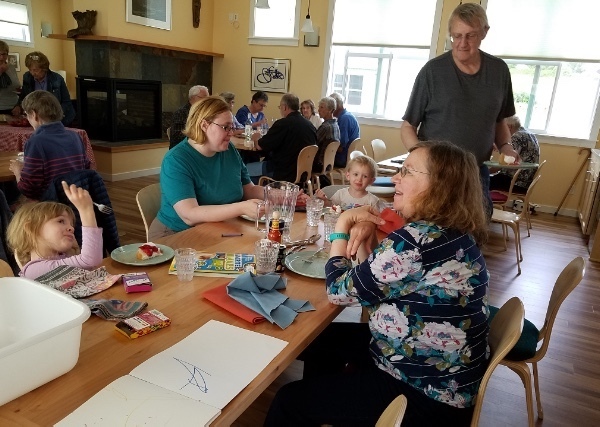 Above, Lexi, Cassie and Ari join members Jeanette and Howard at the table for dinner and drawing. Extra photos by Araya, JimP, Irene and PamD - thanks!